The Indiana Pacers clinched the best record in the NBA, and had earned home court advantage throughout the entire playoffs. 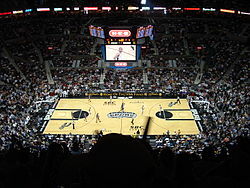 However, when Indiana lost to the Detroit Pistons in the Eastern Conference Finals, home court advantage for the NBA Finals switched to the Western Conference champion Los Angeles Lakers, who had posted a better regular season record at 56-26 than the Eastern Conference champion Detroit Pistons at 54-28. The Minnesota Timberwolves clinched the best record in the Western Conference, and had home court advantage throughout the Western Conference playoffs. However, when Minnesota lost to the Los Angeles Lakers in the Western Conference Finals, the Lakers gained home court advantage for the NBA Finals because the Lakers posted a better regular season record at 56-26 than the Eastern Conference champion Detroit Pistons at 54-28. This was the fourth playoff meeting between these two teams, with the Celtics winning the first three meetings. This was the third playoff meeting between these two teams, with the Knicks winning the first two meetings. This was the third playoff meeting between these two teams, with the Pistons winning the first two meetings. In Game 1, Dwyane Wade hits the game winner with 1.3 seconds left. This was the first playoff meeting between the Heat and the New Orleans Pelicans/Hornets franchise. This was the first playoff meeting between the Pacers and the Heat. In Game 5, Chauncey Billups hits a half court buzzer beater to send the game to OT. 12 years later, Kyle Lowry of the Toronto Raptors would do the same in Game 1 against the Miami Heat in their second round matchup. This was the third playoff meeting between these two teams, with each team winning one series apiece. This was the second playoff meeting between these two teams, with the Pistons winning the first meeting. This was the first playoff meeting between the Nuggets and the Timberwolves. This was the first playoff meeting between the Grizzlies and the Spurs. This was the first playoff meeting between the Timberwolves and the Kings. In the final seconds of Game 5, Tim Duncan hits a fadeaway shot over Shaquille O'Neal to give the Spurs the lead, but with 0.4 seconds left, Derek Fisher off the inbounds pass hits a miracle buzzer beater to give the Lakers the victory. This was the tenth playoff meeting between these two teams, with the Lakers winning six of the first nine meetings. This was the second playoff meeting between these two teams, with the Lakers winning the first meeting. In Game 2, Kobe Bryant hits the game-tying 3 with 2.1 seconds left to force OT. Game 4 is Karl Malone's final NBA game. This was the 12th playoff meeting between these two teams, with the Lakers winning nine of the first 11 meetings. ^ "Team Rivalry Finder — Boston Celtics versus Indiana Pacers (Playoffs)". basketball-reference.com. Retrieved February 15, 2016. ^ "Team Rivalry Finder — Brooklyn Nets versus New York Knicks (Playoffs)". basketball-reference.com. Retrieved February 15, 2016. ^ "Team Rivalry Finder — Detroit Pistons versus Milwaukee Bucks (Playoffs)". basketball-reference.com. Retrieved February 15, 2016. ^ "Team Rivalry Finder — Miami Heat versus New Orleans Pelicans (Playoffs)". basketball-reference.com. Retrieved February 15, 2016. ^ "Team Rivalry Finder — Indiana Pacers versus Miami Heat (Playoffs)". basketball-reference.com. Retrieved February 15, 2016. ^ "Team Rivalry Finder — Brooklyn Nets versus Detroit Pistons (Playoffs)". basketball-reference.com. Retrieved February 15, 2016. ^ "Team Rivalry Finder — Detroit Pistons versus Indiana Pacers (Playoffs)". basketball-reference.com. Retrieved February 15, 2016. ^ "Team Rivalry Finder — Denver Nuggets versus Minnesota Timberwolves (Playoffs)". basketball-reference.com. Retrieved February 15, 2016. ^ "Team Rivalry Finder — Houston Rockets versus Los Angeles Lakers (Playoffs)". basketball-reference.com. Retrieved February 15, 2016. ^ "Team Rivalry Finder — Memphis Grizzlies versus San Antonio Spurs (Playoffs)". basketball-reference.com. Retrieved February 15, 2016. ^ "Team Rivalry Finder — Dallas Mavericks versus Sacramento Kings (Playoffs)". basketball-reference.com. Retrieved February 15, 2016. ^ "Team Rivalry Finder — Minnesota Timberwolves versus Sacramento Kings (Playoffs)". basketball-reference.com. Retrieved February 15, 2016. ^ "Team Rivalry Finder — Los Angeles Lakers versus San Antonio Spurs (Playoffs)". basketball-reference.com. Retrieved February 15, 2016. ^ "Team Rivalry Finder — Los Angeles Lakers versus Minnesota Timberwolves (Playoffs)". basketball-reference.com. Retrieved February 15, 2016. ^ "Team Rivalry Finder — Detroit Pistons versus Los Angeles Lakers (Playoffs)". basketball-reference.com. Retrieved February 15, 2016.